Lead changes. Incredible pace. Controversy. Game 1 of the Stanley Cup Final in T-Mobile Arena had it all. When the game was over, the Vegas Golden Knights had themselves a 6-4 win. They’re now three wins away from being crowned champions in their inaugural season. It was a fantastic way to start the Stanley Cup Final, beginning with a wild pre-game show as only Vegas can do. They had Lil Jon and Blink 182’s Travis Barker start the telecast with a song before a Games of Throne-esque battle on the ice twenty minutes later. Then, for the announcement of the starting lineups, the Golden Knights brought out legendary boxing announcer Michael Buffer. He then uttered his signature line “Let’s get ready to rummmbbble!” sending the crowd into a frenzy. The 10-goal game was a see-saw affair–no lead was safe for long. According to Elias Sports Bureau, Game 1 was the first game in Stanley Cup Final history that featured four lead changes. The only two-goal lead came as Tomas Nosek potted an empty netter with just three seconds left on the clock in regulation. 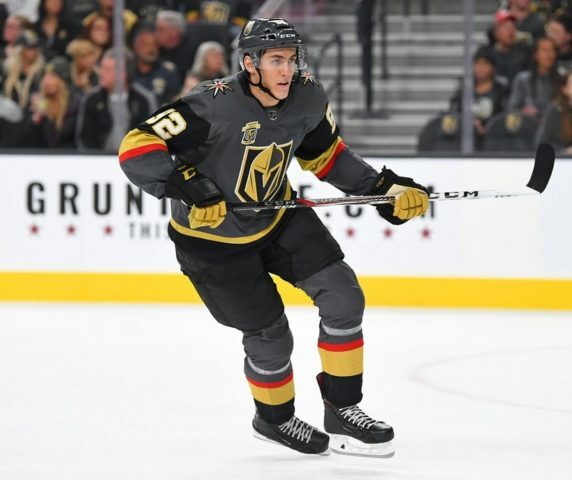 Nosek was part of a dominant Golden Knights fourth line that collected three goals in the third period, after the Caps took a 4-3 lead. He tallied two on the night while Ryan Reaves had the other. The line of Nosek, Pierre-Edouard Bellemare and Reaves was a plus-8 on the night. They dominated their ice time by driving the net, winning battles along the boards and playing with tenacity. 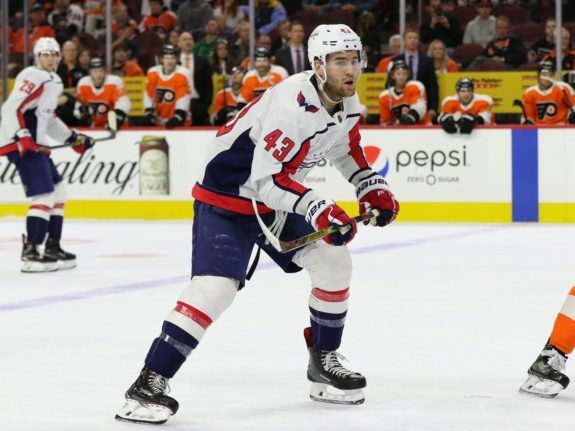 Vegas had five different goal scorers–Colin Miller, Reilly Smith, William Karlsson also added goals, while the Caps got goals from four different players–John Carlson, Brett Connolly, Tom Wilson and Nicklas Backstrom. Alex Ovechkin had one assist and was a relative non-factor in the game. The intensity and pace of the game was completely off the charts for the whole game. The up-tempo game featured fast skating and plenty of physical play. Fans of hockey, let alone either team, had to be holding their breath for long stretches, especially the last few minutes as the Caps pulled Braden Holtby while trying for an equalizer. It’s a good thing there’s a game off between home games and an added one for travel in this series. These teams will need the time to recover. Somewhere, amid the all-you-can-eat buffets, Bellagio fountains and 24-hour wedding chapels, veteran referees Wes McCauley and Marc Joannette lost their whistles for Game 1. Though they’ve officiated nearly 2,200 NHL games between the two of them, they made some egregious errors. The guys in stripes had a rough night. Then again, it wouldn’t be a hockey game without some controversy. 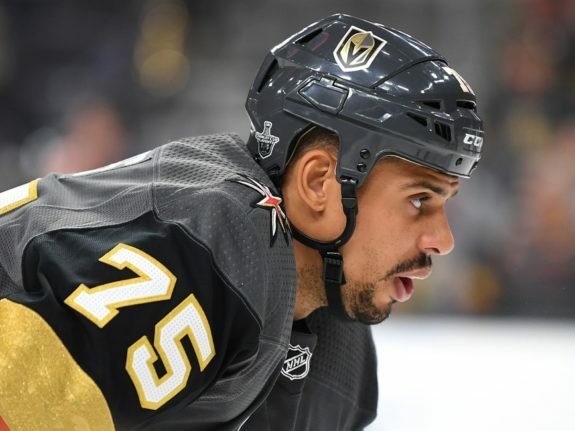 Reaves, who joined the Golden Knights from the Pittsburgh Penguins at the Trade Deadline scored his first goal by going back down, then bar down. The bruising forward cross-checked John Carlson in the back, sending him flat on his face in front of Holtby, then picked up a loose puck and sent it over the Caps netminder. As questionable as the goal was, it counted and greatly influenced the outcome. Carlson was livid after the play. He had every right to be. Reaves should’ve been called for cross-checking and the Caps should’ve been on the power play trying to build on their 4-3 lead. Instead, Vegas tied it at 4-4. In the third period, Wilson skated across the ice and delivered a nasty blow to an unsuspecting Jonathan Marchessault, who didn’t have possession of the puck – it was nowhere near him. The hit sent him crashing down on his back. Initially, the officials didn’t call a penalty, though it could’ve easily been a major. After the linesman and referees huddled, both Wilson and David Perron were given two minute minors. However, had Wilson been called for a penalty on the original play, Perron would’ve never retaliated. “I’m just finishing my check. I haven’t slowed it down. I’ve been told that we’re talking tenths [of a second] here. I think it’s game speed, and I delivered it in good time. I think he let up a little bit because he wasn’t aware I was there. I finished him through his body. He might have been a little bit surprised by it, but it wasn’t an aggressive hit. He looked fine at the end when he was yelling at me from the bench,” said Wilson in the locker room after the game. Bottom line: If the officials can huddle for a penalty that wasn’t called at the time of infraction, the Reaves goal should have been reviewed and waived off for cross checking. If the fast-paced, physical, high-scoring game was any indication of what this series will be about, fasten your seat belts. Reaves knows his team has the right mindset. “We put fun ahead of everything and you can tell. We have a lot of fun. You can tell… guys are having fun in the playoffs. We bounce back after controversy. It’s just a blast,” said Reaves.